Get in touch with nature at Kayaking & Canoeing and Scenic Marine Route. 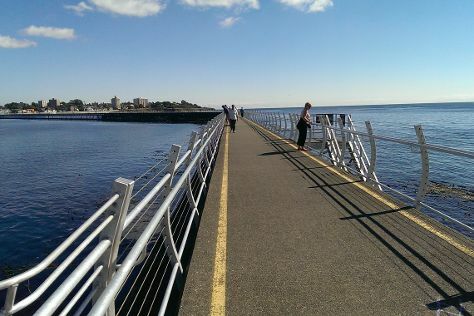 Your cultural itinerary includes sights like Ogden Point Terminal & Breakwater and Victoria Butterfly Gardens. Explore Victoria's surroundings by going to Salt Spring Island (Ruckle Provincial Park, Salt Spring Island Cheese Company, & more), Sooke (East Sooke Regional Park, French Beach Provincial Park, & more) and Enrico Winery (in Mill Bay). On the 17th (Mon), hike the day away at Cowichan Valley trail. Spend the 25th (Tue) exploring nature at Gulf Islands National Park Reserve of Canada. There's still lots to do: have fun and explore at Miniature World, visit a coastal fixture at Fort Rodd Hill and Fisgard Lighthouse National Historic Sites, don't miss a visit to Government Street, and ponder the world of politics at Government House. To find ratings, reviews, more things to do, and more tourist information, read our Victoria vacation planner. The Route module shows you all the different ways you can get to Victoria. In April, daytime highs in Victoria are 14°C, while nighttime lows are 7°C. Finish your sightseeing early on the 30th (Sun) to allow enough time to travel back home.